Ki Sung-yueng's (£4.9m) recent form has turned the heads of Fantasy Premier League managers. The Swansea City midfielder is one of the most-signed players following Gameweek 29. His season-high 13 points in the win over West Ham United has already inspired more than 25,000 managers to transfer him in. With a Double Gameweek to come at some point before the end of the season, Ki could now become a favoured target for those managers yet to activate their Wildcard. Butland's clean sheet at Southampton was a third in six Gameweeks, helping him pick up maximum bonus points for a second successive match. He has now made 103 saves for the season and claimed 18 save points from his last 12 appearances. In both cases they are more than any FPL goalkeeper. Now a regular in Swansea City’s three-man defence, the Dutchman capped his eighth successive Gameweek start with a first goal of the season and two bonus points in the win over West Ham. The 19-year-old collected his first maximum bonus points in Liverpool’s 2-0 win over Newcastle United. He has now started the last four Gameweeks and has earned either a goal, assist or clean sheet in six of his 12 starts. The centre-back found the net at the right end in Brighton & Hove Albion’s 2-1 victory over Arsenal, this after scoring four own goals this season. the The Seagulls' three goals from set-pieces over the first 28 Matchweeks were fewer than any PL side, but Dunk converted Shane Duffy’s (£4.6m) knockdown from a corner. The midfielder extended an incredible run of home form by firing a brace to take him to nine goals from his last 11 starts at Wembley Stadium. Having lost more than 207,000 owners across the previous five Gameweeks, Son is now the second-most bought player ahead of a trip to AFC Bournemouth. 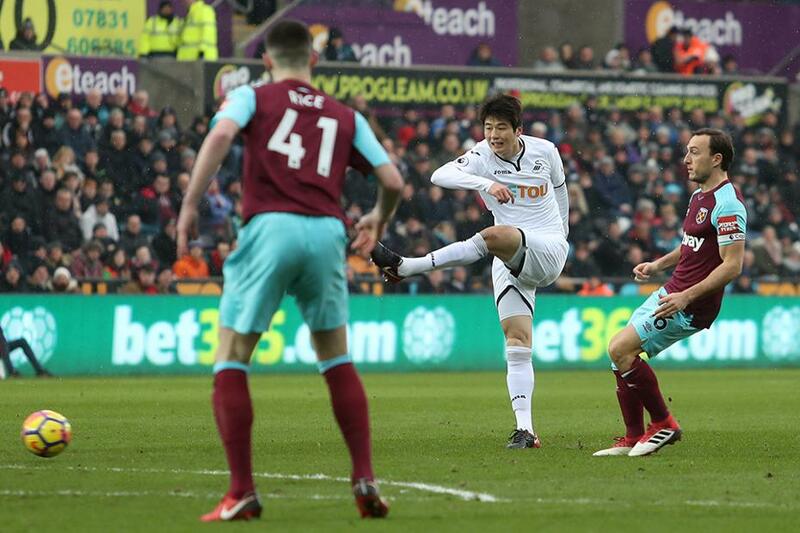 The South Korean's contribution to the victory over West Ham took him to two goals and two assists from his last four Gameweeks. Over that spell, his eight shots and five chances created are both more than any team-mate, helping him to the maximum three bonus points on three occasions. The playmaker earns a first Dream Team call-up having scored the decisive goal in the win over Chelsea on Sunday, also claiming his first bonus points of the campaign. Silva has now started five successive Premier League matches, his most sustained run on the Manchester City teamsheet. A ninth goal of the season, coupled with three bonus points, moved the Algerian to fourth in the overall midfield standings on 150 points. Mahrez has produced a goal or an assist in 10 of his last 13 Gameweek starts for Leicester City. A first goal and bonus points in the comeback victory at Crystal Palace ensured that the midfielder was also rewarded with his Dream Team debut for 2017/18. The Watford captain maintained his recent form with a third goal in four Gameweeks, providing the winner in the 1-0 victory over West Bromwich Albion. It is the first time that Deeney has scored back-to-back goals this season, suggesting that he could be a differential option in Gameweek 31 when the Hornets are one of only eight teams with a fixture. Finding the net for the first time for Everton in the defeat at Burnley, the Turkish striker also picked up three bonus points to earn a Dream Team debut. 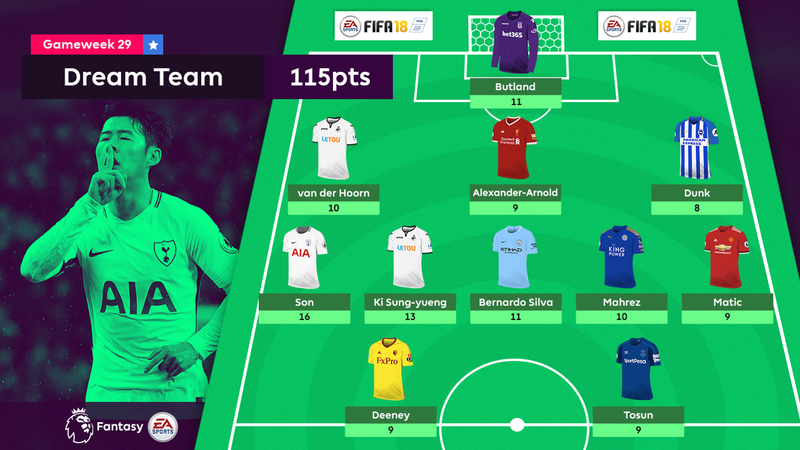 Like Deeney, Tosun presents managers with an alternative target for Gameweek 31 when he travels to Stoke City.